On April 5th I featured the music of Yiorgos Batis. 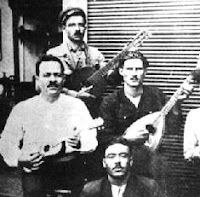 Below is a photo of Yiorgos Batis (he is on the left with his students, outside his cafe at the Lemonadika of Karaiskaki (Tzelepi Coast) (Λεμονάδικα του Καραϊσκάκη - Ακτή Τζελέπη), which he named Georges Baté (Ζώρζ Μπατέ) which turned out to serve a a school for Rebetiko music. 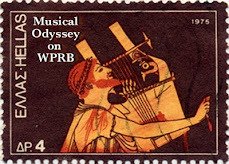 Also don't forget to join the Musical Odyssey Facebook fan page - The link is here. 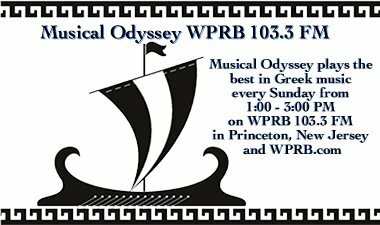 (If that doesn't work you can find the page by searching for "Musical Odyssey on WPRB" in Facebook). Updates to the fan page are coming soon.